Once again: Frozen bread Thursday; fresh Friday & Saturday. 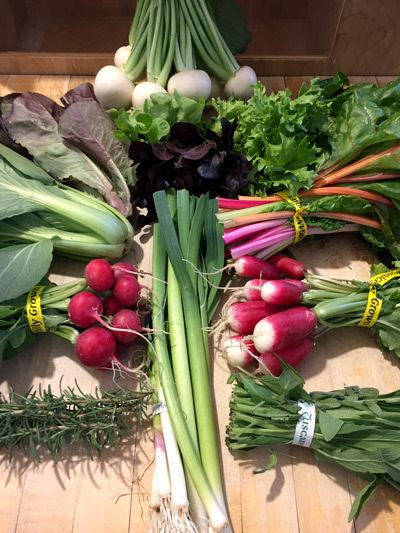 Even more new things this week: bok choy, rainbow chard, HERBS!, young leeks, Hakurei salad turnips, and lots of lettuces! Two farm-visiting opportunities coming up: Village Acres’ FREE breakfast on April 22, and (this is more of a save-the-date) a pig roast & potluck event at North Mountain Pastures on June 3. Scroll down for the list of what we’ll have this week. No matter your religion (or lack thereof) you are probably celebrating this week — the abundant sunshine, if nothing else. Though it looks like our market days are going to be a little cloudier than the past few have been, it is, nonetheless, a dramatic shift in weather. I’ll take it! “I’ll take it!” appears to be what I said to every produce offer that made its way to me this week as well. I’m not sure I’ve ever seen the walk-in so full! It’s good timing, too, for the options to begin to expand, as the storage crops that served us so well through the winter are dropping off the lists. Gone this week are red beets, potatoes, and butternut squash — but in come bok choy, head lettuces, hakurei turnips, and an assortment of herbs — so I’ll take it! Talking Breads is on their honeymoon! All varieties available frozen while supplies last; next fresh delivery is April 27!